Situated on Salisbury Plain in Wiltshire, Stonehenge is probably the most iconic monument in the whole of Europe. The construction of this megalithic structure is thought to have been begun with the bank and ditch around 3000BC and there is evidence of several phases of construction over the next 1500 years. The significance of the site may be much older as mesolithic postholes dated to circa 8000BC were found in the area now used for the visitor car park. 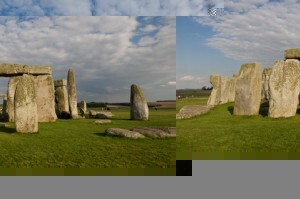 The origins of Stonehenge proper dates from around the time when early neolithic people started deforesting Salisbury Plain to make way for their farms. There is also a proliferation of long-barrow tombs in the area from this time. The first stage of construction of the monument we see today was a bank and ditch 360ft (110m) in diameter. Recent excavation at Durrington Walls, thought to be a campsite for the builders suggests that around 4,000 people from all over the country gathered at the site at the mid-summer and mid-winter festivals. Also dating from this time are the series of 56 pits (known as Aubrey holes) that form a circle within the outer edge of the enclosed area. Excavation of these holes revealed cremated remains and the chalk underlying these graves was crushed suggesting heavy stone grave markers.